INSECT-Class River Gunboat ordered from Wood Skinner of Newcastle on 29th February 1915 and launched on 7th October 1915 as the 1st RN ship to carry this name. Build was completed on 14th November 1915. During 1917 she was deployed in support of military operations on the Danube, baaed at Bucharest. She remained there until 1919 when she took passage to join the China Squadron for service in the Yangtse Flotilla to provide aid for British flagged shipping and British nationals in an unstable environment. During WW2 in February 1942 after a successful WARSHIP WEEK National Savings campaign this ship was adopted by the civil communities of Sudbury and Melford, Suffolk. SCARAB was powered by Yarrow boilers providing 2000 horsepower and an official top speed of 14 knots but capable of 18. She carried a complement of between 54 and 65 and a very respectable armament of 2 x 6 inch guns, 1 x 3 inch gun, 8 x 20 millimetre Oerlikon cannons and 4 x Lewis guns ( from the official logs). September Deployed with Yangste Flotilla. to Passage to join Mediterranean Fleet at Alexandria. June Provided gunfire support for landings in Elba. 3rd Carried out further naval support bombardments with HM River Gunboat APHIS. to Nominated far support of landings in South of France under US Command. four Motor Launches and 12 US Navy PT Boats to form eastern section of SOG. made between Genoa and the Spanish border. 14th Sailed from Ajaccio with SOG except PT boats which joined later. Air cover was provided to prevent enemy air interference. 15th Carried cut bombardments with SOG between Antibes and Var River. 18th Released from DRAGOON and resumed duty with Mediterranean Fleet. August Diverted to Singapore after VJ Day whilst on passage. HMS SCARAB was Paid-off on arrival and reduced to Reserve. In May 1946 she was lent to the Burmese Navy and returned in 1947. Placed on the Disposal List she was sold in 1948 for demolition locally. In recent years a photo album which had not seen the light of day for many years was recovered. The contents were faded and very worn because of time. I have since started having all them professionally re-done mainly of HMS SCARAB. I have also made application over the last 2 years to MOD and received my Father's WWII Medal entitlements which for reasons unknown he did not collect. These include: 1939 - 1945 Star, Atlantic Star with France and Germany Clasp, Africa Star, Italy Star and 1939 - 1945 War Medal. I believe that the contribution made by gunboats SCARAB, APHIS and COCKCHAFER and the significant role they played in the 8th Army advance in North Africa and in the Mediterranean were grossly underestimated. 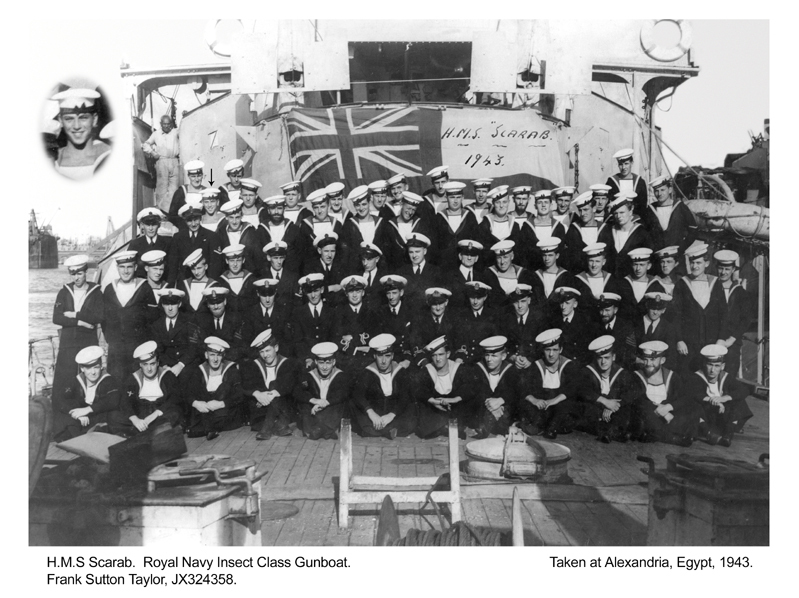 With her small crew of 55-65, the men of SCARAB seem to have been a very close-knit bunch, at least from the photos I have recovered. Dutch Sloop (Gunboat) SOEMBA to impede German retreat. across the Straits of Messina (Operation BAYTOWN – See above references ). 2nd Took part in preparatory bombardments before landings. ports to landing beaches north of Reggio ) during landings. Departed Augusta, east coast of Sicily. 4th To remain under command of Flag Officer Sicily to assist 8th Army. Returned to Malta on release. 2nd To remain at disposal of Commander in Chief, Mediterranean. 24th Taken in hand for boiler cleaning and repairs. November At disposal of Commander in Chief, Mediterranean. SPANKER, BRAVE and RINALDO which cleared 40 mines in advance. WWII: were you involved that June in the D-Day landings at Normandy? Fairbanks: No, but I did take part in a smaller invasion in the Mediterranean that month – the tiny island of Elba, where Napoleon had spent his first exile. At 6 a.m. on June 17, 1944, a Free French Bataillon de Choc was to land on the island’s south coast. Four hours earlier however, I was to lead a group of PT-boats to the north, in hopes of diverting German forces toward us. After our commandos landed and signalled us, we began firing, smoke-laying, rocket-launching and blaring pre-recorded sound effects. The Germans responded with tracers and 140mm guns, but fortunately their fire was inaccurate. One German we found in a little sort of cement hut was chained to his machine gun-his superiors were afraid he’d run away. He stopped shooting, but he couldn’t get away from his gun, and he was afraid we’d shoot him. He was a little butcher from Hamburg, and he was terrified, poor fellow. But he managed to hang a dirty white handkerchief to the muzzle of his gun, and he survived. to two groups between Porto Fino and Arno River. Sea Rescue and HMS ULSTER PRINCE for Fighter Direction duties. WWII: What was your role in the Allied invasion of southern France? Fairbanks: The Americans were to land at three places simultaneously - Saint-Tropez, Saint-Maxime and Saint-Raphael - on the morning of August 15. Prior to that, my BJ unit was to stage its largest diversion since its inception – two big mock invasions, one to the right and one to the left of the actual beachhead. I was to command the operation from HMS Aphis, an old British Yangtze River gunboat. She and her sister ship, HMS Scarab, each mounted a 6-inch gun as its principal weapon. We also had 12 American PT-boats, some air-sea rescue craft (ASRCs) and some amphibious raiding craft called MLs (motor launches). We were also afforded backup firepower from the destroyer USS Endicott, commanded by Lt. Cmdr. John D. Bulkeley, who had already won the Medal of Honour for commanding the PT-boat squadron that evacuated General MacArthur, his family and staff from the Philippines in 1942. For the first stage of our operation, we landed a group of French commandos, called the Groupe Navale d'Assaut, at La Pointe des Deux Freres, between Cannes and Nice - the first Free French troops to return to mainland France. WWII: What diversionary tactics were you able to then bring into play? Fairbanks: Our small craft broadcast lots of meaningless radio chatter while a single sirplane was dropping tinfoil that somehow gave the German radar the impression of an imminent major air attack. At the same time, aircraft dropped 300 dummy paratroopers in the hills near Toulon. They were inflatable dummies that I’d invented myself. They could be packed into a small-size carton, and when released, they would blow up into a full-size man. Some were on a smaller scale, so that they would look like they were farther away, in the far distance. They were also booby-trapped, so that when Germans came up to take a closer look at and inspect them, they’d blow up at a touch. Dirty trick, wasn’t it? 14th Departed Ajaccio with SOG except PT Boats which joined later. 15th Carried out bombardments with SOG between Antibes and Var River. Gunboat APHIS and US Destroyer ENDICOTT. Note: Royal Navy Ships were under overall command of Vice Admiral H K Hewett. Between mid-June 1944 and the end of July more than a division a week and huge stocks of vehicles, equipment and supplies, were withdrawn from U.S. Fifth Army in Italy to train and stage for Operation Dragoon. Final approval for Dragoon came on 11 August 1944, and the landings took place 15 August, between Toulon and Cannes on the French Riviera, preceded by a parachute drop inland, behind the German lines, and commando raids. Over 900 ships and 1300 landing craft were utilized, covered by a huge air fleet of 1300 British, American, and French bombers. Over ninety-four thousand troops went ashore on the 15th, composed of three U.S. divisions (3rd, 36th, 45th) supported by French and British units. Eleven thousand vehicles were also landed on the first day. They were followed several days later by U.S. VI Corps HQ, U.S. 7th Army HQ, French First Army, and French I and II Corps, all operating under the command of Lt. General Alexander M Patch’s Seventh U.S. Army. The operation was a phenomenal success. Within two weeks the Allies had captured 57,000 prisoners and opened the major ports of Toulon and Marseilles at a cost of less than 7,000 casualties. Dragoon forces then advanced nearly 400 miles north up the Rhone River Valley toward Lyon and Dijon, capturing Lyon on 3 September. In less than 1 month, on 11 September, they linked up with Patton’s Third Army west of Dijon, creating a solid wall of Allied forces stretching from Antwerp, Holland to the Swiss border. Four days later, Dragoon forces were reorganized into the 6th Army Group, under the command of Lt. Gen. Jacob L Devers, reinforcing Eisenhower’s force in Europe to three full army groups. Operation Dragoon was an outstanding success. The Allies annihilated Hitler’s 19th Army, captured over 100.000 German prisoners, liberated the southern two thirds of France and linked up with the Normandy invasion forces, all within thirty days. Until the port of Antwerp was opened in November 1944, the ports of southern France were the source of more than one-third of Allied supplies in Europe. (Ex Italian Navy) and UJ6083 (Turkish yacht Kemid Allah). Both corvettes were sunk and 210 survivors taken prisoner. (See eye-witness account below – Special Operations Group). Some information shows evidence of controversy and substantial differences. For example the site http://www.military.com/Content/MoreContent?file PRdoug and http://www.military.com/Content/MoreContent?file PRdoug2 - an interview with Douglas Fairbanks in his real-life role as a naval officer in World War II - Lieutenant Commander Douglas Fairbanks Jnr, USNR Commander of the Special Operations Group's Eastern Diversionary Unit (Specialist in Diversion) aboard SCARAB's sister ship HMS APHIS when both she and HMS SCARAB were involved in a battle with two German Corvettes. USS ENDICOTT was called to assist and arrived (as Fairbanks relates) when the action had already more or less been concluded. (The US version tells a different story.) Please refer to the above references and USS ENDICOTT site on Google. There is also a reference to Operation Brassard (Elba) which is very interesting (see above). WWII: While you engaged in this diversion, I think you got a surprise of your own, didn’t you? to come to our assistance. At 6:10, we opened fire on the enemy ships which turned out to be two corvettes: Unterseebootjager-6083, which had formerly been the Italian Capriolo, and Kemid Allah, a former Egyptian khedivial yacht that had been purchased by the Germans and converted into a warship with two radar-controlled 88mm guns. Commanded by Lt. Cmdr. Hermann Pollenz, they had just left Toulon and were en route to Marseilles when they ran into us. WWII: What did you do? Fairbanks: Not much. Besides learning very quickly that we were outclassed by the enemy, I learned from my gunnery officer that our guns were overheated and would need a few minutes before they’d be fit to fire again. I ordered our MLs to screen us a best they could, and we circled around in the smoke while the enemy’s accurate gunfire straddled us ever closer. The radar of both gunboats was shot away, but we fired back with our small anti-aircraft guns. WWII: In the heat of action, I suppose your fear had been overcome by the need to fight and to survive? Fairbanks: No. Indeed, I was still terrified. I had a way of disguising it- somewhat- with a forced show of good spirits. Usually, only I knew that my light-hearted banter was my own private form of hysteria. I’d also deliberately drop my helmet, my binoculars and whatever other objects I could on the deck in order to have an excuse for ducking the next salvo of flying metal. Fortunately, Aphis’ skipper was as calm as if he were on a peaceful exercise. Although damaged, the two gunboats had not taken any casualties thus far. At last the gunnery officer announced that our 6-inch guns were cool enough to use again. Then, when we emerged through a thin spot in the smoke screen, we found ourselves at right angles across the bows of the oncoming Germans – “crossing the enemy’s T.” It was a classic manoeuvre accomplished through sheer luck. I don’t recall whether or not I gave the order, but in any case, Aphis fired a point-blank salvo without the benefit of any targeting device, and by golly, we scored a direct hit on the Uj-6083, while Scarab scored a damaging near miss. Uj-6083 began to list, while Kemid Allah seemed to hesitate. WWII: Didn’t the destroyer Endicott arrive to help you out? Fairbanks: Yes, but it was really all over by that time. Admiral Bulkeley and I didn’t always agree on what happened. But as I recall, Endicott arrived in time to strike Kemid Allah a mortal blow. Kemid Allah’s ammunition began to explode, and she went down at 7:09. After launching two torpedoes at Endicott, which missed, Uj-6083 finally sank at 8:30. Endicott rescued 169 German survivors, while Aphis and Scarab picked up another 41. WWII: Did the Germans have anything to say about the action? Fairbanks: Yes , he did. He was furious, but he gave the proper naval salute. August (cont) Returned to assault area. September Deployed in Adriatic in support of shore operations, based at Ancona. service during WWII and survived. China Station after war service in the Mediterranean. Mr J D (Dave) Downey of Ballarat, Victoria, Australia was my Father’s best mate. I first enquired of him if Dad would mind me going into his war service. He gave me an order - “Do it”. Dave Downey was a WWII Sergeant , a decorated veteran of the Pacific Campaign and a family friend for over 50 years.